How many players can say they have been part of six promotions, won a Wembley final, been relegated once and almost seen their club go out of business? Whatever might be said about the career of Truro City captain Jake Ash, it certainly has not been uneventful. 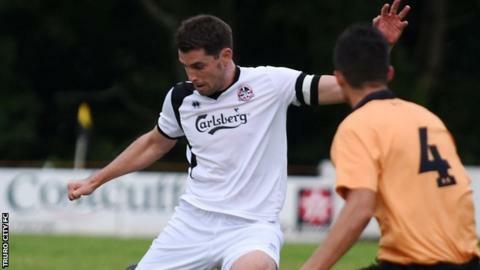 The 32-year-old has just celebrated a testimonial at the Cornish club, where he has played for 10 years. "I've been inordinately lucky," Ash told BBC Radio Cornwall. "I've enjoyed unbelievable success and some of that's down to playing with great players." He joined Truro from Falmouth Town in 2005 as the club began an incredible rise up the English football pyramid. They were runners-up in the Cornish South Western League in that season, but backed by their then-owner Kevin Heaney, won four more promotions to join the Conference South in 2011 - as well as winning the 2007 FA Vase at Wembley. But the nationwide financial crisis started to bite on their property-developer owner. The club went into administration in 2012 and were only saved from going out of existence after the club's new chairman, Peter Masters, stepped in at the last minute. They were relegated to the Southern Premier League at the end of that season, but last term won promotion via the play-offs and are set to return to the second-tier of non-league football, with Ash still in the centre of their defence. "I've worked with him for the last 18 months, first as a player and than as a manager, and he's been a different class for me," said manager Steve Tully. "He's been there, done it, seen it all before and he definitely helps out with all the young players and he's always welcoming new players in and he makes them feel at home. "He is a true gentleman both on and off the pitch." Ash managed to miss a penalty in his testimonial game against Torquay United, but after more than 350 games for the club, he now has his sights set on helping Truro reach the top tier of the National League. "I'm 32 and I still feel alright, so I'm hoping there's still a few more seasons in me yet," he added. "The league we're going up to is harder, so we won't won as many games as we did last year, I think that's fair to say, but if we can consolidate this year and have a good go in the cups and see where we end up and then maybe build towards having another go at it next year."